Luurnpa Catholic school is part of the Wirrimanu Community located in Balgo Hills Western Australian. All students are Indigenous. The majority of students speak Kukatja as their first language. The local community has a strong and vibrant Indigenous language and culture. In 1982, the Balgo community decided to ask the Bishop for a Catholic school. They asked that the school be staffed by teachers who would be willing to stay and adapt to local conditions and that there be a secondary school so that their children need not leave the area for further schooling. They requested that their children be educated in the Catholic faith. Brothers of the De La Salle Order and Sisters of Mercy agreed to take over the school and Brother Leo Scollen became the principal of Luurnpa School at the beginning of 1984. At the beginning of Term 3 2011 the Kutjungka Trade Training Centre began. The Centre serves the upper secondary students of the Balgo, Mulan and Billiluna communities as well as providing adult education. Today year groups are divided into the following; Kindergarten and Pre Primary, Grades 1 and 2, Grade 3 and 4, Grades 5 and 6, Grades 7, 8 and 9. The Upper Secondary attend the Kutjungka Trade Training Centre. Each class has a teacher and one or more Aboriginal Teacher Assistants. Every year the school is fortunate to have volunteers such as Share The Mission volunteers (De La Salle Volunteers) to support student learning. 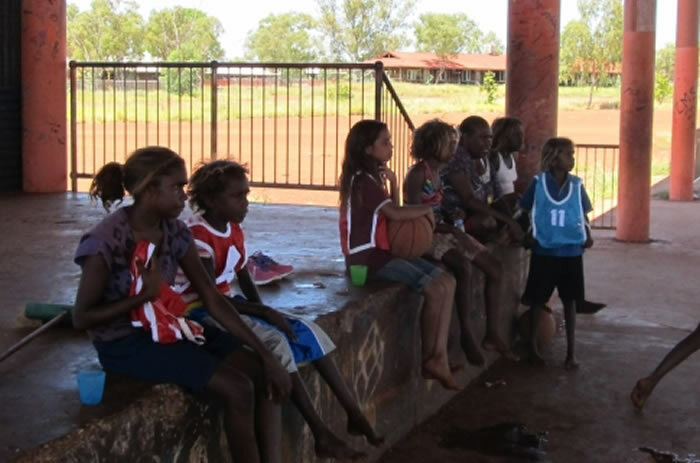 Most of the Balgo community speaks Kukatja, which is one of the Western Desert languages. It is the main means of everyday communication. Some of the many languages spoken at Wirrimanu are: Kukatja, Walmajarri, Jaru, Pintipi, Warlpiri and Kriol. Most of the adults are trilingual, and, except the elderly, do have s sufficient command of English to communicate with Non-Aboriginals for survival needs, for example at the store, and with administration personnel. General community meetings are conducted in Kukatja. However some Aboriginal Council meetings are conducted in English, in the presence of the non-Aboriginal persons. As the council comes to accept more responsibility, more and more discussions are held in Kukatja. The Kukatja people’s history of contact with non-Aboriginal people has been associated from the beginning with the Catholic Church. The first impact of the Church was in 1934, when it acquired a cattle station homestead “Rockhole” near Halls Creek with the intention of establishing a leprosarium for the Aboriginal people. Hansen’s Disease was reported to be rampant among the Desert Aborigines at that time. Requests to the Government for funds to maintain the project were refused, and the project ceased. Further contact was made in 1939, when Father Alphonse Bleischwitz a member of a German missionary order (The Pallottines) was directed by the Bishop to abandon Rockhole Station and move further south with the sheep, camels, horses and personnel of the Mission outpost. A succession of camps was set up, with almost yearly evacuations forced by flooding in the wet season and lack of adequate water supply in the dry. They celebrated Christmas 1939 at Tjaluwan, then moved to Tjumantura and eventually found what was thought to be a suitable site near the Balgo Hills (‘Parlku’ – the grass growing on the slopes of hills – in Kukatja) in 1942. The aim of this settlement, according to Father Worms, an anthropologist, (who with Bishop Raible had visited the area a year or so before the movement down from Rockhole) was to provide a buffer between the traditional Aboriginal way of life and the new life on the cattle stations where the Aborigines were under the control of the European settlers. Gradually the group was joined by a small group of Aborigines. Several reasons were given for the Aboriginal movement to the established settlement, or Mission. One was that the Aborigines from the desert were forced out of their natural food gathering areas, as the Australian army moved in and established ammunition dumps in the desert during World War II; another was the availability of bread and tea, for a little work. Because of government regulations relating to his internment as a German National, during the Second World War, Father Alphonse was placed under “house” arrest in the Kimberley region, being told to stay south of the Sturt Creek. Some Aboriginal people from Beagle Bay (the seat of the Catholic Diocese at the time) had come with the priest to act as “missionaries” to the desert Aboriginal people. This group were later joined by some members of the Religious Order of Sisters established by Bishop Raible for the indigenous people of the Kimberley. In 1956 some St John of God Sisters joined the Pallottines to further expand the mission community. There were the usual difficulties associated with living in an isolated, desert region, but stone and clay were available nearby for simple buildings as well (at first) as an adequate water supply for daily needs and for establishing fruit trees and a vegetable garden. Food supplies and building materials had to be brought in as well as fuel for the generator which provided electric power for a few hours each evening. Wood was used to fire the large brick oven where bread was baked. Desert Aborigines who came and camped nearby were given food and medical care. In the early 1960’s, difficulties arose because of a dispute over the siting of the mission within the Billiluna pastoral lease, which added to the now urgent problem of establishing an adequate and permanent water supply. A new site, 17 km to the east was chosen in 1964 at what is now known as Balgo. Wirrimanu is the name the Kukatja people use for this present site. In 1965, the new site became operational and a primary school was opened in Wirrimanu and was, until the end of 1983, run by the WA Education Department. In 1984 at the request of the local community the school became a Catholic school and was named Luurnpa Catholic School.